Getting engaged is a huge milestone for every couple. From planning the proposal itself to choosing the perfect ring and then finding the perfect way to announce your upcoming nuptials there is so much to consider. Aside from actually asking your boyfriend/girlfriend to marry you, one of the most important aspects is buying the perfect engagement ring. When it comes to making such a big monetary investment, you need to be sure that the ring you choose for your partner is affordable, and reflects the life long commitment and eternal love for them. Spending one to three months on an engagement ring seems to be widely acknowledged and simply accepted by many in the Western world, but where did this ideology come from? And since when did the diamond become the ultimate emblem of love? The belief that you had to gift your girlfriend or boyfriend with an engagement ring that costs a couple of months wages first started in 1930. American Diamond mining and diamond jewellers De Beers started a campaign suggesting that a single month's salary should be spent on an diamond engagement ring for your desired spouse. 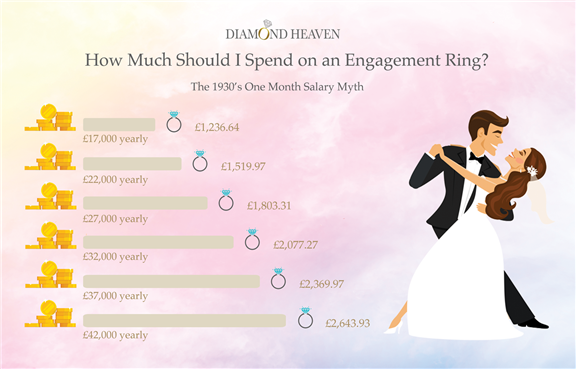 Fast forward 50 years to 1980, they released another advert suggesting that an engagement ring should cost two months salary. Later on, it then became three months salary. The engagement ring is one of the biggest assets in a married couples life, and thanks to the De Beer's clever marketing campaign, they managed to get loved up boyfriends and girlfriends around the world to splash out on a few months wages for the perfect rock. Fast forward 13 years after the initial marketing campaign, and the second part of the iconic crusade for diamond engagement rings was created. In 1947 another breakthrough marketing campaign came from copywriter Frances Gerety. She coined the term ‘Diamonds are Forever' for marketing agency NW Ayer and Son. They were working with De Beers, and unsuccessfully trying to come up with a sell line that would perfectly describe the beauty and significance of a diamond, until Gerety crafted the timeless ‘Diamonds are Forever' phrase. What made this so significant was the fact that at the time diamond was the hardest substance known to man, and it became a metaphor of eternal love. Combine this incredible tagline with the above salary rule, an gifting a diamond ring to your future wife or husband became paramount in the process of getting engaged. Of course, you don't actually have to spend one to three months worth of salary on a diamond ring, pick a price point which is suitable for you. It doesn't have to be a diamond either - sapphires, rubies and emeralds look just as beautiful next to white gold, platinum, rose gold and so much more. So, spend as much or as little as you want on the ring and live happily ever after! If you'd like some advice on Diamond Heaven's engagement rings, or you'd like to discuss finance options then do not hesitate to get in touch.